Come and experience warm hospitality in a relaxing and comfortable owner managed accommodation only minutes away from the well known Addo Elephant National Park. In house Guests are spoiled in the renowned cuisine, where food is presented with flair. Indulge your senses throughout the five-course meal with a selection of South African estate wines from our down stairs wine cellar. Voted one of the Top 30 restaurants in South Africa. Four-star graded and a member of various professional accommodation bodies, our guesthouse is set in a tranquil environment with tropical flavour. Offering 13 large luxury guest rooms, each designed in delicate shades of to allow a peaceful nights sleep after a busy day on the game trails. 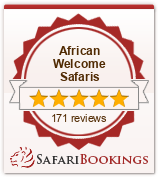 Our luxury accommodation can handle large touring parties with ease still offering traditional african hospitality. Smaller than our large de lux rooms, also graded 4 star with onsuite bath and shower. For the single traveler not wanting to have to pay a single supplement this room is perfect. Spacious with lounge area and ensuite bath and shower. All rooms has private entrances. Personal touches has been added to make each guest feel special and spoiled. The view from these rooms differ from garden views to views of the pool area. If you would like to have your breath taken away, this is just for you. This room has it’s own water features, spa bath, private patio area and garden, secluded from the other rooms, a perfect hide away for honeymooners. Situated 300 m from the main establishment this self contained cottage offers two on suite bedrooms, a lounge area, kitchenette and outside braai, perfect for the traveler wanting to stay for numerous nights doing their own thing. All the facilities offered by Cosmos Cuisine are available to guests using this option. Situated 300 m from the main establishment this self contained cottage offers two bedrooms with one bathroom, a lounge area, seperate kitchenette and outside braai, perfect for the family wanting to stay for numerous nights doing their own thing. All the facilities offered by Cosmos Cuisine are available to guests using this option. Once you are checked in, unpacked and relaxed with a welcoming drink, feel free to explore our facilities. Take a few hours sunbathing by our pool or take a dip in the crystal clear waters. Wonder through our lush gardens and Koi dams before enjoying lunch or dinner in our restaurant. Relaxed and revitalized you’re ready to explore the wonders of Elephant Valley. Cosmos Cuisine offer a full tours service with half and full day trips to ADDO Elephant National Park, Kwantu Game reserve: Big 5 reserve, Schotia Tooth & Claw Night Safari, Pumba 5 Star Big 5 Reserve or the spectacular Walk with elephants tours. After such a busy day its back to Cosmos Cuisine and your promised extravagance at our restaurant and savour the fine cuisine whilst remembering the stunning sight and sounds of your day. With all this and a level of service unsurpassed in the Eastern Cape makes. Whether you are a party of 2 or 30, Cosmos Cuisine will create the ideal holiday experience. By now you have check in and are exploring your new home. Allow us to introduce to your some of the features that are available at Cosmos Cuisine Guesthouse. Firstly, you can take a walk in the tranquil tropical gardens Alternative just lounge in the garden or by the pool. Taking in the sounds and smells of our tropical garden. Or simply relax in our comfortable guest area’s. At Cosmos Cuisine Guest House we are geared to sooth and relax you whilst with us. Welcome to our guesthouse restaurant where in house guests will delight in the tastes and aroma’s of our exquisite cuisine. Start off with breakfast from our buffet, choose between a selection of home made breads, muesli, fruit and meat platters, only to name a few of the continental items, before you are spoiled with our full english options, changing with special dishes frequently, we even cater for special dietary requirements from Vegan to Gluten free.We are open for guests from outside, if you would like to enjoy a light lunch. At night time a five course culinary experience can be enjoyed by candle light. Cosmos Cuisine has been awarded by BOE and MOET Chadon as one of the 30 top restaurants of the Country. The most exhilarating comments are however quoted in our visitors book as being “the best we had in South Africa”. We aim to use fresh produce from our beautiful Valley, including citrus and venison like Kudu, Eland and Gemsbuck, finishing each dish with garnish from our herb and flower garden. Our food focuses on true South African tastes presented with flair and perfection. From an intimate for two or a celebration banquet for a wedding, or conference or even an anniversary or birthday bash, select the wine best suited for your meal from our walk in cellar, or enjoy our House Wine, cultivated on our Deetlefs family estate in Rosselville. Then after your meal, settle down in our guest lounge, adjoining the restaurant, for a relaxing brandy or coffee.